Passengers who have inadvertently left their property in a taxi booked through Delta should report the loss via this online form within 48 hours. 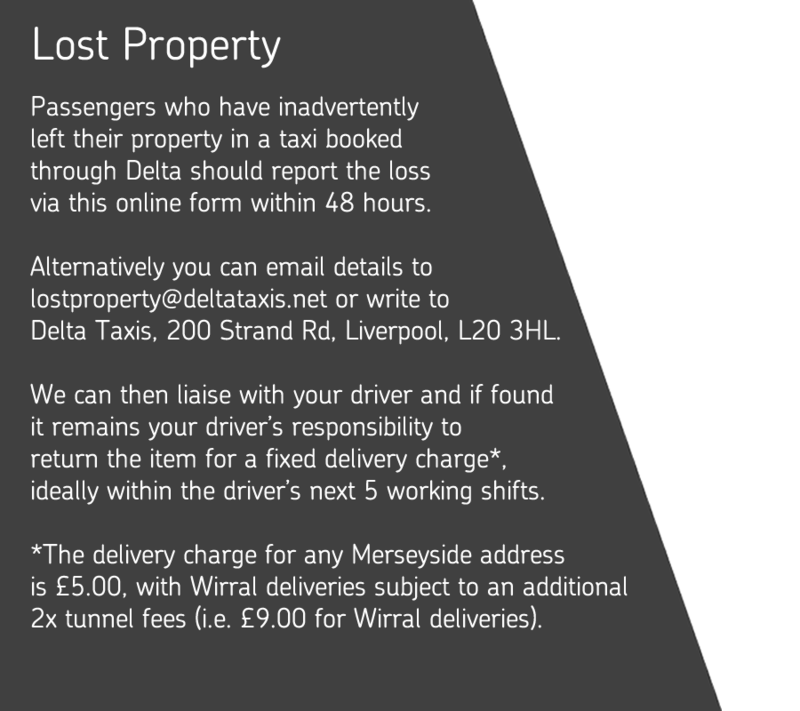 Alternatively you can email details to lostproperty@deltataxis.net or write to Delta Taxis, 200 Strand Rd, Liverpool, L20 3HL. We can then liase with your driver and if found it remains your driver's responsibility to return the item for a fixed delivery charge*, ideally within the driver's next 5 working shifts. *The delivery charge for any Merseyside address is £5.00, with Wirral deliveries subject to an additional 2x tunnel fees (i.e. £8.60 for Wirral deliveries).